Ocean acidification (OA) due to rapidly increasing anthropogenic CO2 emissions represents a widespread threat to marine calcifiers. This topic was a primary focus of my doctoral work with Dr. Gretchen Hofmann at UCSB and is ongoing through collaborative efforts with other researchers. Through my doctoral research, I applied an interdisciplinary approach to examine how climate change-driven processes, such as OA, impact marine invertebrate larvae living in coastal regions. This was accomplished using two distinct approaches: (1) oceanographic observations of pH variation and water mass properties to identify ecosystem-specific patterns of natural variation and (2) organismal-level culturing experiments to test the thresholds of physiological response in larvae to altered seawater chemistry. Manríquez PH, Torres R, Matson PG, Lee M, Jara M, Seguel ME, Alarcón E, Sepúlveda F, Pereira L (in press) Effects of ocean warming and acidification on the early benthic ontogeny of an ecologically and economically important echinoderm. Marine Ecology Progress Series. Yu PC, Sewell MA, Matson PG, Rivest EB, Kapsenberg L, Hofmann GE (2013) Growth attenuation with developmental schedule progression in embryos and early larvae of Sterechinus neumayeri raised under elevated CO2. PLoS ONE 8: e52448. Matson PG, Yu PC, Sewell MA, Hofmann GE (2012) Development Under Elevated pCO2 Conditions Does Not Affect Lipid Utilization and Protein Content in Early Life-History Stages of the Purple Sea Urchin, Strongylocentrotus purpuratus. Biological Bulletin 223: 312-327. Hofmann GE, Smith JE, Johnson KS, Send U, Levin LA, Micheli F, Paytan A, Price NN, Peterson B, Takeshita Y, Matson PG, Crook ED, Kroeker KJ, Gambi MC, Rivest EB, Frieder CA, Yu PC, Martz TR (2011) High-frequency dynamics of ocean pH: a multi-ecosystem comparison. PLoS ONE 6: e28983. Matson PG, Martz TR, Hofmann GE (2011) High-frequency observations of pH under Antarctic sea ice in the southern Ross Sea. Antarctic Science 23: 607-613. Yu PC, Matson PG, Martz TR, Hofmann GE (2011) The ocean acidification seascape and its relationship to the performance of calcifying marine invertebrates: Laboratory experiments on the development of urchin larvae framed by environmentally-relevant pCO2/pH. Journal of Experimental Marine Biology and Ecology 400: 288-295. Fangue, NA, O’Donnell MJ, Sewell MA, Matson PG, MacPherson AC, Hofmann GE (2010) A laboratory-based, experimental system for the study of ocean acidification effects on marine larvae. Limnology and Oceanography: Methods 8: 441-452. 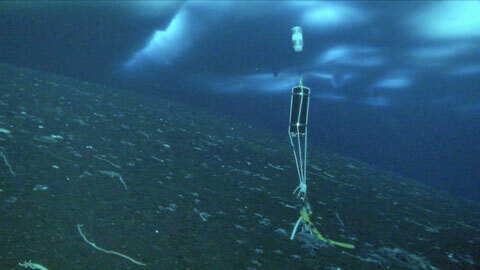 SeaFET pH sensor deployed under 2 m of sea ice in McMurdo Sound, Antarctica. 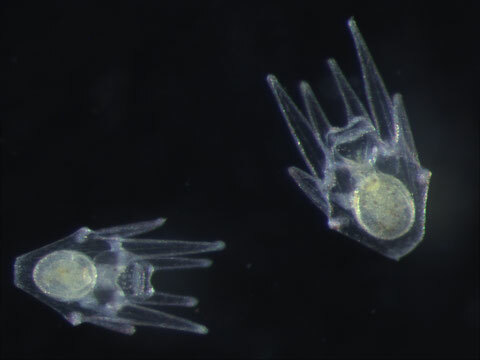 Two 10-day old pluteus-stage larvae of the green sea urchin, Strongylocentrotus dorebachiensis.